Masonry is the laying or constructing of buildings from individual units. These units can be stone, concrete, or brick and come from the earth. Access to rock and soil is necessary for all types of masonry units as the units are solid or mixtures of clay, mud, silt, and water, sun dried to ‘baked’ to hardness. The Greeks built buildings of stone units, chiseled and cut and stacked to perfection. The Romans introduced concrete and mortar, the glue and the paste between the individual units. While Greek stones were massive and put in place by lifted in place by pulleys, Roman masonry was constructed by hand and arranged in patterns on the floor, in walls, and on the inside and outside of buildings. Countries without stone utilized brick, but it wasn’t until 1628, with the earliest commercial mass production of brick in England, that manufactured masonry units became an important building material. Stone, brick, and concrete masonry are strong in compression and used in arches, vaults, domes and walls. Their weakness is in tension. When reinforced, the concrete block provides resistance to lateral loads and provides structure for brick facing. Their beauty endures through centuries and leaves a record of the human hand. Masonry units of stone, brick, and concrete are in many buildings. They are used structurally as well as non-structurally. They come in many sizes, shapes, colors and applications. Take a walk around your neighborhood. Look for masonry use. Remember masonry comes from the earth directly as stone, or mixed and baked as bricks and blocks. Take pictures of stone, concrete, and brick masonry. Create a poster of your printed images stacking the different types. Masonry comes in a variety of shapes, sizes, colors and textures! Bricks, made from the clay of the earth by hand and originally dried by the sun, are now manufactured with standardized sizes in many colors. The colors originate from the color of the soil and the length of the baking time. Also, now there are color additives and even surface glazings that are possible. Here are some basic sizes and types. Take a look at the various sizes of bricks. Bricks are also classified based on their quality. First class bricks are table molded. The surfaces and edges are sharp, square, smooth and straight. These bricks are evenly burnt and uniform texture. They also make a metallic ring when struck together! First class bricks are on facades. Second, to fourth quality units deteriorate in uniformity and are used to build foundations, floors, and walls. They do not make the metallic sound and are often over burnt and irregular in shape and texture. Bricks can assume different positions and these positions have names. The stretcher or ‘face’ of the brick is when it is horizontally exposed. The header is the short end of the brick place horizontally or vertically; masons create a pattern by alternating headers with stretcher faces. A soldier course is when the units stand vertically. Draw a hand holding a standard brick; label the dimensions, then label the names of the sides. Concrete masonry units are larger blocks made of concrete, hollow or filled, and frequently used in bearing wall construction. They are larger in size than bricks which mean that the mason can build higher faster. The hollow interior offers the options of being filled with solid concrete to create a more structural wall, or remaining open and allowing room for vertical insulated piping and conduit. 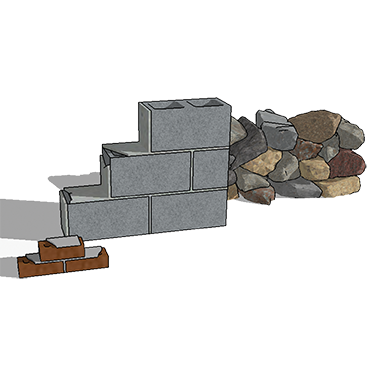 Mortar is a workable paste that masonry workers and bricklayers use to bind building blocks such as stones, bricks, and concrete masonry units together. Mortar, from the Latin mortarium means crushed, and is a combination of soft mud, clay, sand, concrete, asphalt, and water, etc. The ancients used lime and gypsum, or plaster, to repair structures, working to match original ingredients. Today the most common binder in mortars is Portland Cement. It fills and seals the irregular gaps between units. Mortar comes in many colors and many types of finishes. The different finishes are one of the crafts of the bricklayer who finishes the mortar with trowels and tools. 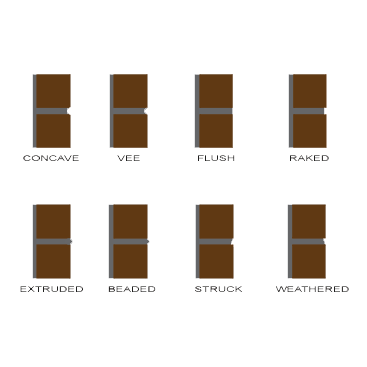 Draw and label eight different mortar finishes in section and match with a picture of bricks and mortar with that finish to show its expression. Besides durability, one of the pleasures of masonry units are the many possible patterns. 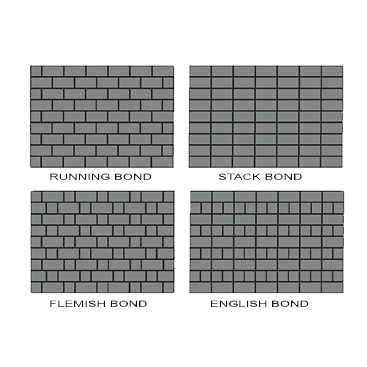 Patterns in masonry are called bonds, and one of the most frequent patterns is the running bond where bricks are alternatively stacked and staggered horizontally by a third. Masons in different countries experimented with patterns in many ways. 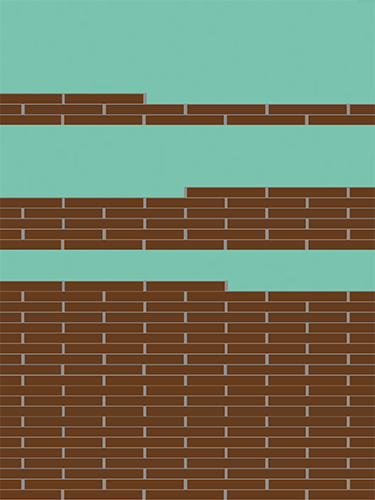 The Flemish bond alternates stretchers and headers while the English bond alternates and repeats patterns every third row. In Masonic terms, ‘setting a course’ means building a row; in this way, different expressions of craft and artistry visualize the work of the craftsman. The basket weave and herringbone pattern appear in brick walks and patios. Draw and label as many different patterns that you can find in masonry! Now that you are becoming familiar with masonry units, patterns, and uses, it is time to look at the technical aspects that masons use to build walls that are enduring and last a long time. Walls are built of stone, masonry, brick and composite materials. 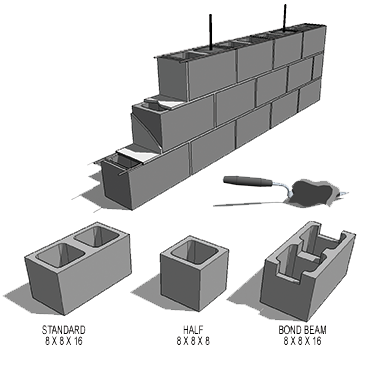 Masonry **walls88 can be infill, or non-structural, or weight bearing. Infill walls close of an area between structural components carrying the weight of the roofs, floors and walls above. Weight bearing walls are reinforced and built up of layers of concrete masonry units to carry the load, and bricks are laid as face veneer. The mason connects welded wire mesh between the concrete masonry units and the bricks to ‘tie’ the two courses together. Brick walls are beautiful as they have a textured appearance of the hand -laid bricks. 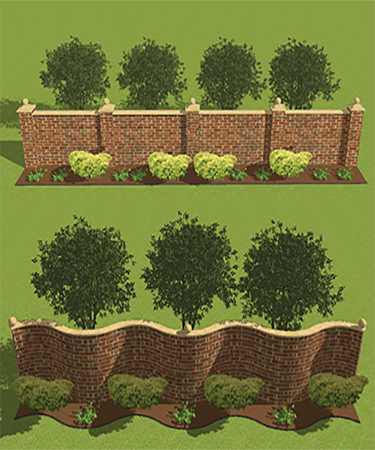 Brick walls can curve or rise straight. After a certain height, the walls must be reinforced so that they do not fall over. Masonry walls are reinforced with a thickened area called a pilaster or pier at regular intervals. Take a look at these masonry wall details. Draw a curved masonry wall and a tall reinforced wall in your journal. A stacked bond is structural. The header is the front face of the brick. Which units came first, bricks or stone?